There wouldn’t be a fight, generally speaking. Let me show you why I say so. Here’s what is a stake for the coyote when a German Shepard Dog gets interested in a coyote. Here’s team Mom and Dad coyote. That’s Mom at the left of the frame. Big. Irritable, look at her ear, end stage otitis I believe. Here’s Dad charging my dog and me. Yeah, its a bluff and we were on the other side of a chain link fence. Now, the following photograph, I did not take, it was taken by a friend of mine, Janet Kessler in a San Francisco park. Coyotes have skin in the game. That particular German Shepard-ish Dog is someone’s pet. It lives in one world. Coyotes live in the real world and take care of real business every day. In the above photo, no real dirty work was required. The German Shepard-ish Dog is a pet and totally out of its element. I’m talking typically. The above shot was part of a series. The other shots showed a chase and some maneuvers. The coyote danced its way into the position we see. The coyote has practiced all its life on this stuff. It isn’t like in a dog park. Generally, although a German Shepard Dog has the weight advantage, coyotes with their experience and situational intelligence have a considerable advantage over a German Shepard Dog. The dog pictured has never seen real action. Nor has it really seen a very motivated opponent. The stuff dogs argue about? Who gets to keep the ball. Coyotes can puff up and make themselves look way bigger than their average of about 26 to 30 pounds out here in the West. There’s no hint of play in their demeanor when their family’s safety is at stake. I think it is safe to say that because of the size of a German Shepherd Dog, coyotes don’t want to eat it. They don’t rank it as prey, it’s an interloper. Coyotes deal with interlopers a lot. That pictured dog? He’s getting it in gear to run away at full speed. He’s a real chicken, and needs to be. He tried to pick on someone smaller, and he got told. Coyotes intrude on each other’s territory all the time. They test one another looking for fun or for the chance of a gain. At stake is their food, their mate, and their children. I’ve read from studies that unlike wolves, coyotes have one coyote defend their territory. Wolves I’ve read just kill intruders. Coyotes? Their strategy is to give an intruder a thrashing. Enough so that an intruder won’t forget. With my coyotes, Mom was there as backup and Dad did the work. Here’s a real contender. Note it looks like he had lost an eye, maybe in a fight. He’s in his prime, and he hooked up for life with one of Mom and Dad’s daughters. After he came on the scene, I didn’t see Mom and Dad again. They had grown old and had aches and pains. The last time I looked, a few years ago, it seemed that not much was known about coyote inter-generational transfers of territory. In this one observation of mine, it looked pretty ugly. And in urban and suburban settings, coyotes don’t want a fight. They huff, puff, and bluff to warn an intruder away. And they will run away. That can be a rope a dope, a run for a better site for parrying, or to keep on distracting a dog until it gets worn out. They don’t want contact. They don’t want to be injured. But a dog? They tire sooner, or get called back by their owner. The dogs don’t know the territory as intimately as a coyote has to know its own territory. For a pet dog, they just don’t have game. The coyotes I’ve seen seem to have most dogs figured out. To a wild coyote, a dog in coyote territory acts untutored in the ways of the wild. Coyotes live in all of our parks, and they can be seen on the streets sometimes. So always remain vigilant when out walking your dog. If you see a coyote, keep away from it. Most of the time coyotes will flee as they see you coming, but sometimes they may not, and I want to address this potentiality here. The safest protocol always is to shorten your leash and walk the other way, no matter how far or near a coyote is. This sends a signal to the coyote that you and your dog are not there to challenge the coyote’s personal or territorial space. If you see a coyote while walking your dog, shorten your leash and go the other way. Coyotes are territorial animals. They don’t allow coyotes other than family members into their territories unless they’re maybe just passing through. The good news about this is that territoriality keeps the coyote population down naturally in any particular area. You and your leashed dog should just keep walking on and away from the coyote — just passing through. Coyotes and dogs know how to read each other on a level that we humans are not very tuned into: the same thing occurs between dogs: one twitched facial muscle reveals their position to other dogs. So, when walking your dog, please don’t stop and allow this communication to take place or be acted upon — just keep walking away, dragging your dog after you if you must, showing the coyote that you have no interest in her/him. If for some reason you find yourself closer to a coyote than you should be and the coyote growls at your dog — know that this is a warning message meant to keep your dog from coming closer: “please stay away from me”, “please don’t come closer”, “please go away”. It may be set off by the dog being in, or heading for, the coyote’s personal or territorial space, and/or may involve negative communication between the animals. It is not necessarily an indication that it’s “an aggressive coyote”, rather, it’s more likely to be “defensive” behavior aimed at making the dog keep its distance or leave. Please heed the message! Coyotes and dogs generally do not like each other. Every coyote I know has been chased multiple times by dogs, and they remember this and are ready for the next time, or the next dog. You can prevent this message from escalating by shortening your leash and walking away — this shows the coyote you aren’t a threat, and the coyote will learn this. If you have a dog, always walk away from a coyote, dragging your dog if you have to. This also holds true for when you are in your car with a dog. If close enough, the coyote might growl if he/she perceives your dog — who is usually hanging out the window and staring or even barking — as a territorial or personal threat. 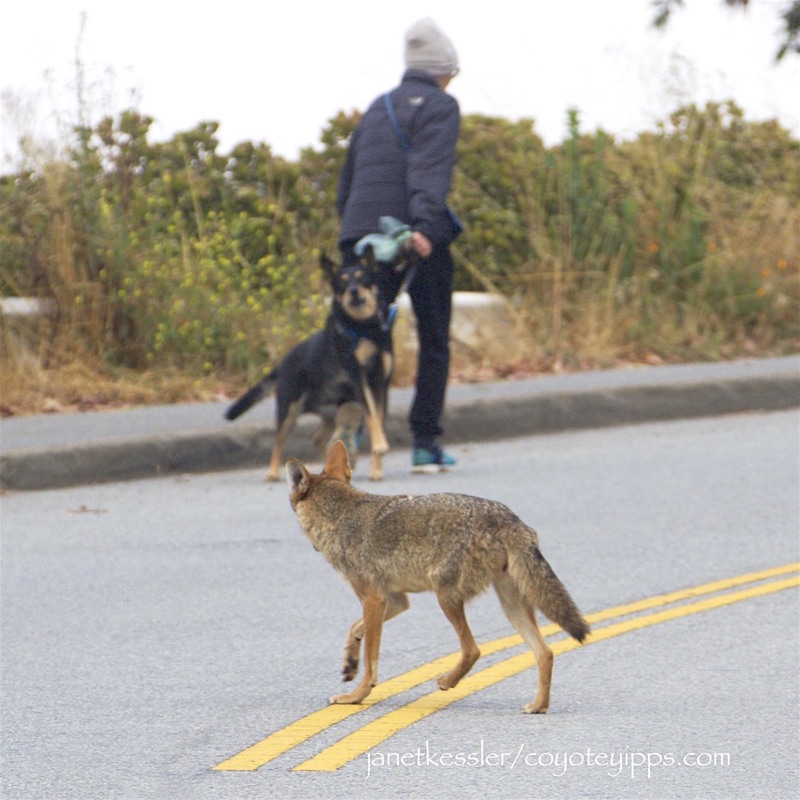 It’s best to drive on rather than allow visual communication between your dog and a coyote. A coyote who is walking towards you, again is messaging you more than anything else: making sure you are aware of its presence so that you and your dog will know he/she is there, i.e., that the territory is taken, and possibly even assessing if the dog will come after it. There’s an aspect of curiosity here, but it’s more investigative. Again, just walk away, and keep walking away with your short-leashed dog in-tow, even if the coyote follows you for a little bit. Prevention is always the best policy, and that involves keeping your distance. Once your dog and a coyote have engaged, you’ll have to try your best to pull your dog away and then keep moving away from the coyote. Scare tactics — such as making eye-contact, lunging at (without getting close), clapping and shouting aggressively at a coyote — do not always work. 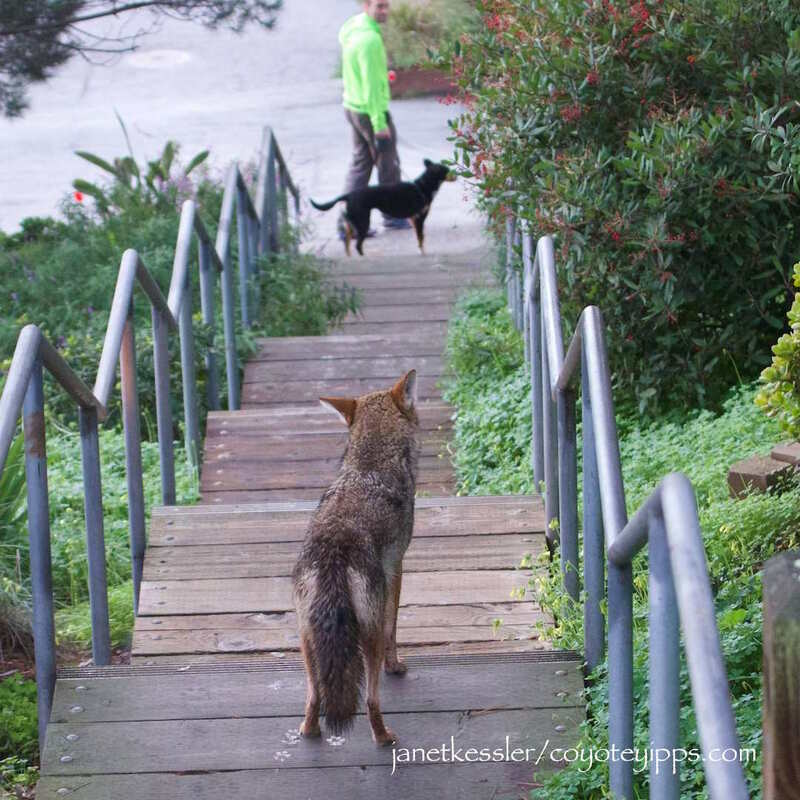 If you choose to shoo it away, follow the guidelines in the video at the top of this blog: Coyotes As Neighbors: what to know and do, but know that it’s best to practice utter prevention proactively than to reactively have to scare off a coyote who comes too close. 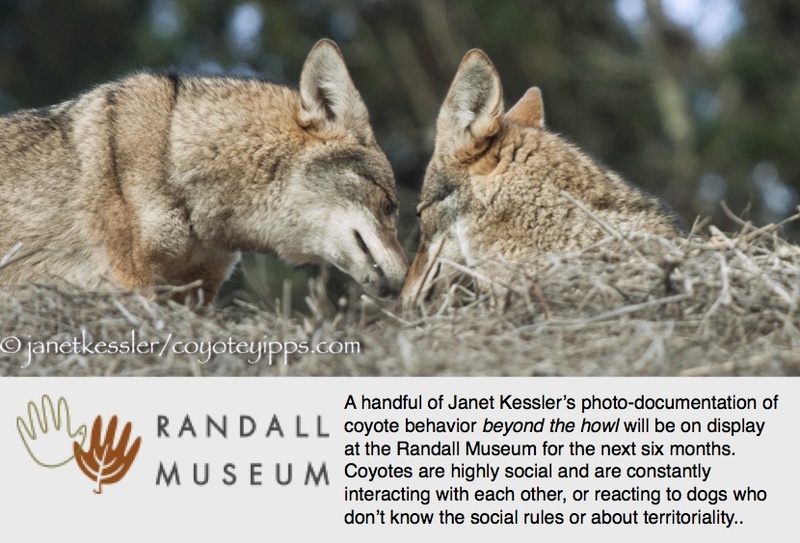 Here is a concise flyer on How to Handle A Coyote Encounter: A Primer. In this video, a coyote who begins her evening trekking routine, is spotted by a dog and harassed. After sprinting to escape him, she uses her wits to avoid a face-to-face confrontation. Although the dog may look as though he’s close to the coyote’s size, the dog easily outweighs her in heft by about double. I have read where, to escape from pursuing wolves (which weigh two to three times as much as a coyote), coyotes will run up and down hills. A coyote is light, so running up a hill doesn’t take nearly as much effort for them as for a wolf. The wolf, who needs to expend much more energy going up the hill, wears out quickly and soon gives up the chase. Coyotes are able to figure this out and use hills strategically for their advantage. Please also note that, although the coyote was able to wear out the dog totally, it also was exhausting for the coyote. She collapsed in the grass for a long time in order to recover. This amounts to harassment of wildlife and is actually illegal. Please don’t allow your dogs to chase our urban coyotes!.